This 8ft x 8ft Waltons Overlap Apex Wooden Garden Shed provides a large amount of space that can be used for a variety of purposes. 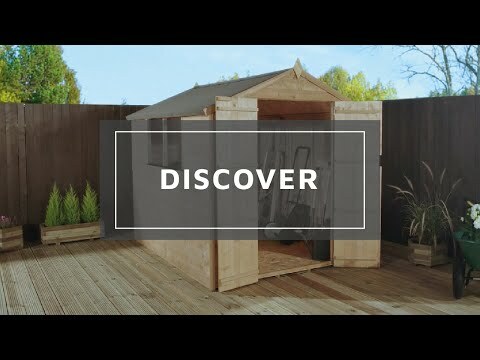 From storage to a mini workshop, this wooden garden shed can accommodate them all. The panels of this building are crafted from 8mm thick overlap boards which are supported by a 28mm x 28mm frame, this helps to create a solid structure that is durable. The floor and roof have been crafted from 9mm thick solid sheet board, making this garden building ideal for storing general garden items. The side windows can be placed on any side during construction to suit the style of garden. Styrene glazing has been used as a shatterproof alternative to traditional glass, making it safer if you have a young family or a busy garden in general. The apex style roof aids with water drainage, whilst the included sand felt helps to protect the wood beneath it from the weather. The double door entrance makes access more convenient if you are intending to store larger items. A butterfly catch will be included to keep the doors closed. It is wonderful that you are so pleased with the quality and value for money of your overlap shed. Review:We bought a basic she's. It fits together well and is just what we wanted. It is great to know that assembly was straight forward and that your overlap shed suits your needs well. Thank you again for your much appreciated review. Review:Excellent product and excellent service. Thank you for taking the time to leave such kind feedback. Review:the shed I've bought looks good, but not too sturdy, so I hope it's going to last. I would have preferred a stronger structure. Review:Only problem was with the centre roof beam, which was warped and not very strong. I uprated it myself. And Waltons refunded me. Our Reply:Please accept my apologies for the issue with the roof beam but I am glad this was able to be resolved easily enough, although I am sorry for any inconvenience this may have caused. Our Reply:Thank you for taking the time to speak to me earlier and I am glad we were able to offer a gesture of goodwill for you resolving the mentioned issues yourself. Our Reply:I am pleased that you find your overlap shed is sturdy and are pleased with the quality overall. Review:Have been very disappointed with the product. I understand it was cheaper than the tongue and groove but I was expecting better quality. As this rate it looks like it will need replacing in a year depending on the weather. Our Reply:I am really sorry to hear about the issues that you have had. I have tried to call you earlier today and left a voice message which I hope you will pick up later. I would like to discuss the mentioned issues and resolve anything that might still be outstanding. Review:Product was of ok quality. Easy enough to build together. However had to use more screws than was supplied and the hut has some holes in the sides due to knots in the wood but would be very hard to find a better product for the money! Our Reply:It is fantastic to know that you are pleased with the value for money on your overlap shed and that assembly was straight forward. Thank you for your feedback. Review:Great purchase to be recommended. Our Reply:It is great to know you are happy with your overlap building. Our Reply:I am sorry about the issue with the ridge bar but pleased your builders were able to resolve the issue. I am thrilled to know that item was what you expected and that you would be happy to use us again in future. thank you for your feedback! Our Reply:I'm glad your feel your shed is good value for money and I apologise for the missing part. If you are able to contact us on 01636 880514 we can send this or reimburse you for the cost if you have purchased already.